When it comes to multitools, there’s one brand that stands out from the rest: Leatherman. The name is synonymous with quality and innovation, and each successive generation of Leatherman tools improves upon the last. Sticking with its tradition of pushing the design envelope, Leatherman introduces the Charge TTi, a high-end, ultra-compact multitool featuring titanium handles. If you’re looking to carry the best of what Leatherman has to offer, the TTi is for you. Bronze bushings make the tools smooth and quick to open. The Charge TTi is part of a broader line of Leatherman multitools bearing the Charge name. Originally, the Charge line consisted of the Ti and the XTi, two high-end tools whose major distinguishing characteristic was having handles made from titanium. For 2007, Leatherman has added three new members to the Charge family: the TTi, the ALX, and the AL. As you might expect, the TTi is an upgraded version of the Ti and XTi. The AL and ALX, meanwhile, come with handles made from 6061 T6 aluminum, an ultra-light and super-strong material used in aircraft construction. There are also minor variations among the tools included in each unit. We’ll discuss those shortly. Leatherman has added several key design elements to all of these gorgeous new Charge tools. For instance, the knife blades are bigger and wider to give you more cutting edge. The pliers can withstand 133% higher squeezing load than Leatherman’s original tools, enabling a tighter hold for tough jobs. 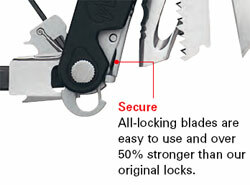 You’ll never have to worry about the Charge coming unhinged, either, thanks to a 50% increase in lock strength. Multiple bit drivers also are a standard feature, and each tool has bronze bushings at the hinges to make opening components a snap. You may be asking whether you want to buy titanium or aluminum. Although both offer superior durability and strength, titanium has an edge in both departments. Titanium is also slightly lighter than aluminum, so it would be a good choice if weight is a major concern. However, titanium also costs more, which is something to factor in if saving .2 ounces doesn’t matter. The TTi supplants the XTi as Leatherman’s top-of-the-line multitool. Not only is the TTi .10 ounces lighter than the XTi, but it also packs an S30V stainless steel knife that delivers an optimal combination of edge retention, flexibility, and hardness. This is an upgrade from the XTi’s 154CM steel knife, which previously was the highest grade knife you could get from Leatherman (incidentally, Leatherman outfitted the Charge ALX and AL come with 154CM blades, an upgrade from the standard 420 series knife). The TTi also has a crimper and a cutting hook. The crimper is an ideal accessory for anyone working with electrical wires or metals, while the hook is a fantastic addition for those who need to be ready for emergency situations. All three Charge iterations come with a premium leather or nylon sheath. Both versions will carry the tools in their open or closed position and two side pockets hold your extra necessities—even a mini-flashlight. An inside back pocket holds Charge's included bits and has room for a full Bit Kit (sold separately) giving you up to 42 bits to choose from. Don't want to wear a sheath? Then clip your Charge to your jacket, backpack or car's visor with the removable pocket clip. Or, choose the quick-release lanyard ring. With it, you're able to safely keep the tool on any lanyard and detach it quickly when you need it. The Leatherman phenomenon began in 1975 when founder Tim Leatherman embarked on a trip across Europe and the Middle East in a cranky Fiat. Leatherman, an engineer by training, became so fed up with breakdowns and other hassles that he fashioned a prototype of what he called a Pocket Survival Tool out of cardboard. Two years later the first PST was born in his basement, and the rest is history. Today the Leatherman company produces dozens of different multitools, knives, pruners, and accessories, and is recognized across the world for its cutting edge designs and superior quality. 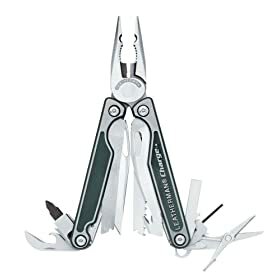 Leatherman Charge TTi multitool, leather carrying case, 6 double ended drill and screw bits, removable pocket clip, quick-release lanyard ring.